Most of the recipes in this blog are for a single meal, but many can be made in larger batches and then divided up into multiples meals that will be ready to heat and eat. Phase 2 is often one of the more challenging times since your portions and ingredients are so restricted that you are probably cooking your own food and then may also be cooking for your family. You can go ahead and mix up a pound of ground beef into meatballs, and then either cook them all and save them to be reheated, or freeze them raw and then bake them until done for a meal. The same goes for meatloaf. I made a batch of chicken soup and saved enough for three more meals. Chili would work well for that, and even the sauce for zucchini spaghetti. One of my favorite time-savers is to portion out my meat ahead of time so I can just cook it up without having to weigh it out. Ground beef is great because you can get a package of it and weight it out, form it into balls or patties and freeze it for later use. Then take out a couple at a time and put them in the fridge to thaw so they're redy to go when you're ready to cook. I have also cooked a roast, then shredded it up while still hot so the fat separates easily, and portioned it into containers for individual meals. The same idea works well for chicken breasts. I have a hard time getting motivated to make myself a salad - when not on P2 and restricting how many/much goes in, I want a really hearty salad with lots of different things. I like to chop up lots of veggies, but it's time-consuming to get them all out, chop, etc. I don't usually want to do it just for myself. BUT if I can make a bunch of salads at once, it's totally worth it. I saw this idea on pinterest one day and loved it. It works great for me and the salads easily last at least a week in my fridge. What have you made ahead or in larger portions? How many days did you prepare the salads for? 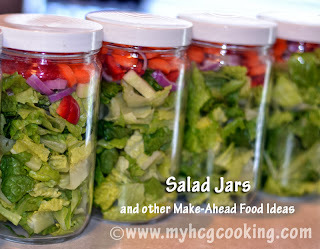 Did the lettuce last when you split it in jars for days? I was surprised but yes, I made salads for 7 says and it lasted just fine. I used whole hearts of romaine that I washed, chopped and dried (in a salad spinner). I didn't use anything wet in there though, no tomato. I think that is why it did well - dry lettuce and no really wet ingredients. I have to make everything up ahead. Otherwise I crave unhealthy things. Can I just say the biggest thank you from the bottom of my heart for your info. <3 You're welcome! So glad it's been helpful for you. Everyrecipe is a search engine that compiles the best Australian cooking sites and blogs from the Internet. Several hundred blogs are already enrolled here and are taking benefit from the traffic we are sending to their sites. hmmm its very well written but if hcg work then why FDA didnt approve it? I am new to this diet and it is my fourth day on phase 2 . I am having the hardest time with not drinking coffee ... Am I allowed to have any? Mainly just because I cannot drink coffee without creamer lol . plus do you have any tips on the best drops to get . I purchased isodrene drops and realized 2 days later they said hormone free. Are they pointless then ? Thank you again! Your blog is helping me to be able to stay on this diet! HCG is an FDA approved medication.